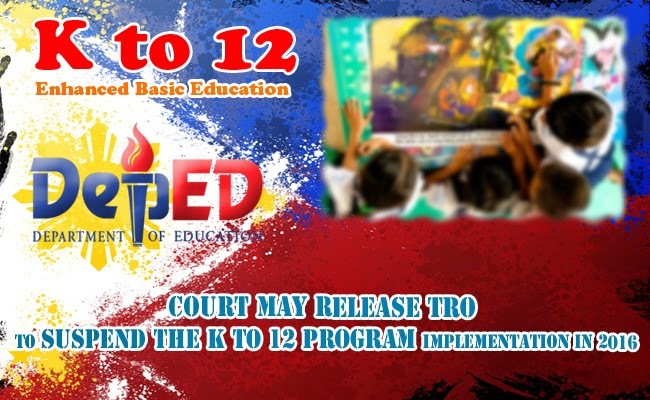 An opposing group against the implementation of the program K to 12 is now asking the Supreme Court to release a Temporary Restraining Order to suspend the program’s implementation in 2016. The group wanted to stop RA No. 10533, the Enhanced Basic Education Act of 2013 together with its rules and guidelines. The Suspend K to 12 Alliance is seeking to nullify the DepEd Memorandum 2 series of 2015 in connection with the said republic act. Under the K to 12 program, all students must undergo kindergarten followed by six years of elementary education, then four years in junior high school and two years in senior high school. This new program that had been talked about in recent years is set to be fully implemented in 2016. The alliance had pointed out that the government is still not yet ready for its implementation. The country is currently experiencing insufficient function halls and classrooms, teachers, non teaching personnels, and instructional materials. In the released statement of the alliance, they say that the government had never allocated more than 4% of the GDP through the global standard stands at 6%. The K to 12 program is expected to worsen the insufficiency problem. Another point the petition headed by Prof. Rene Luis Tagle wanted to reason out is that the failure of the program to give security for the jobs of 111,351 college teachers and 22,838 non-teaching personnels. If the program will be implemented, far smaller number of students will enroll to college in 2016 and this will lead to probability of the workers being laid off and losing their security of tenure. There will be two years gap and large colleges and universities will have less students. The group plans a mass protest against K to 12 on May 9, 2015. On the other hand, DepEd says that the program will bring better education system for the country.